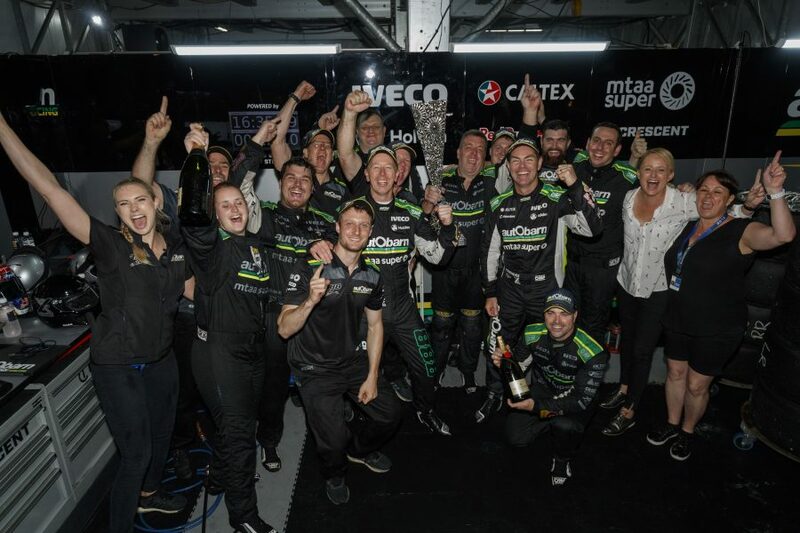 Steven Richards credited the ‘luck of the Irish’ for helping the Autobarn Lowndes Racing Holden he shared with Craig Lowndes secure the PIRTEK Enduro Cup on Sunday. Overall victory in the three-event contest added to the recent Bathurst triumph for Triple Eight’s third car, which is engineered by Irishman John McGregor. Lowndes and Richards went into Sunday’s race needing only a 14th-place finish – even if nearest rivals Scott McLaughlin/Alex Premat won – to take the enduro title. Richards, however, had a tough opening stint, falling from third to sixth by lap 24, and then spinning Warren Luff at Turn 4 four laps later. That incident and a later pitlane release that sent Lowndes straight into the path of Garth Tander were both under investigation when the race was abandoned due to a storm. With no result declared or points awarded, Lowndes and Richards were assured the Enduro Cup title – a first for Richards and second for Lowndes, who won with Luff in 2013. “There’s no doubt about it, an element of luck played its part for sure,” reflected Richards, whose co-driving future is unclear amid Triple Eight’s move back to two cars. “I wasn’t trying to pass anyone. Luffy had a big slide off Turn 2, I just put my foot on the brake, the fronts locked and I was just trying to minimise the amount of contact. “Straight away, the first thing that happened, the steering was a bit right-hand-down, it felt OK, as in the car, but absolutely your heart sinks. “It’s not what you come out to do as a co-driver. I pride myself on not making mistakes and I made one which could have been very costly. Second place for Lowndes and Richards on Saturday came despite starting 21st, with a poor qualifying including a five-place grid penalty for impeding Richie Stanaway. Lowndes had been warming his tyres at the exit of the first chicane and was not informed by McGregor that Stanaway was approaching on a hotlap, leading to contact. Lowndes said McGregor was deeply upset by his own error and required consoling before heading into the afternoon’s race. “The biggest issue we had to overcome was just getting Irish pumped up a bit. He was devastated,” he said. “It's a mistake we made, collectively as a team, and we copped the penalty. I said to him after the podium 'we've just got to believe' and we got the job done. “It's tough on engineers as well, not just the drivers. He felt gutted because he didn't give me the information about where Richie was and others. “That for him was a personal letdown for the team, not just for me but the team. He takes everything to heart but that's what makes him such a good engineer as well. McGregor is set to return to Europe following the shutdown of Triple Eight’s third entry, which he worked on as a data engineer in 2016, before stepping into the main role last year.